200 & 300 Series Metallic Basecoat Gallon - Gallon Alone - Buy Custom Paint For Your Automobile Or Motorcycle At Discount Prices! Featured in this listing is one full unreduced GALLON of the KemBase sparkle metallic car paint basecoat color of of your choice (choose from drop down menu below). Reducer and clear is not included in this listing but is required to use the product. 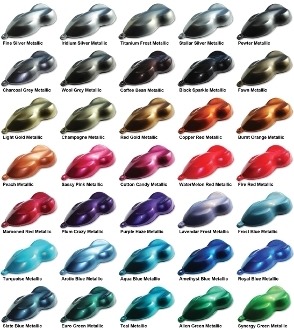 Also offered but not on the color chart is Gun Metal Grey metallic, Lemans Blue Metallic, and Rallye Green Metallic. Now available in a wide range of colors including solds, pearls, and metallics. See other listings for details. Metallic paint available in these colors: Stellar Silver Metallic, Silver Ice Metallic, Platinum Mist Metallic, Fine Silver Metallic, Tungsten Metallic, Black Sparkle Metallic, Charcoal Grey Metallic, Gunmetal Grey Metallic, Wool Grey Metallic, Pewter Metallic, Coffee Bean Metallic, Texas Tea Metallic, Copperhead Metallic, Beryllium Orange Metallic, Burnt Orange Metallic, Red Gold Metallic, Egyptian Gold Metallic, Light Gold Metallic, Champagne Metallic, Fawn Metallic, Dusty Rose Metallic, Sassy Pink Metallic, FireHawk Metallic, Crimson Crush Metallic, Mystic Maroon Metallic, Slate Blue Metallic, Shady Blue Metallic, Plum Metallic, Viola Crystal Metallic, Sangria Metallic, Dark Quasar Blue Metallic, Royal Blue Metallic, Blue Ray Metallic, Aqua Blue Metallic, Arctic Blue Metallic, Euro Racing Green Metallic, Galactic Green Metallic, Zombie Green Metallic, Apple Green Metallic, Teal Metallic. Shipping is based on order total and orders over $400 ship for free to the continental USA. Visit our shipping map for an estimate of how many working days it will take for you to receive your product. 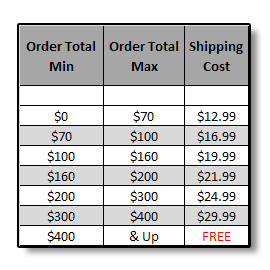 See the chart below for shipping cost to the continental USA. Check local regulations before purchasing. Some areas require a "low VOC" automotive paint for compliance with new air regulations. Should you require a low VOC paint we have one available for this color. To find the low VOC version of this color enter the color name in the search box above and look for the option showing cans with green labels. The map below shows some known low VOC regulated areas in red. However, regulations change often so always check your local regulations before purchasing. Contact us at info@thecoatingstore.com for more details.